The volleyball team had a very successful weekend at the Leopard Invitational, winning all four of their matches to bring their overall record to 14-7. The Leopards started off their winning streak on Friday against Chapman, whom they lost to earlier in the season by a score of 3-1. The match went a full five sets with Chapman taking the first set, 25-21. La Verne took the next two sets 25-18 and 25-20. Chapman showed they wanted to leave with a win and took the fourth set, 25-23. However La Verne shut down the Panthers, taking the final set, 15-12, and leaving the final score, 3-2. The Leopards’ second match was against Greensboro College of North Carolina. 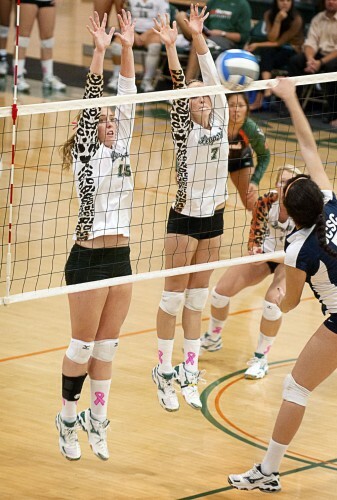 La Verne dominated in a sweep, 25-13, 25-15 and 25-10. Their third match took place on Saturday against UC Santa Cruz. The Banana Slugs put up a fight but La Verne took the match in a sweep again, a trend for the weekend. The Leopards led early on in the first set, 13-5, but almost allowed Santa Cruz to come back when they closed the gap to 23-19. They ultimately held on to their lead long enough to take the first set, 25-19. In the second set, the Banana Slugs stepped up their game and forced the Leopards to play even harder if they wanted to hold on to their lead. Excellent kills were made by both teams, keeping the score tight throughout the set and leaving both teams on their toes. A few errors were made by La Verne towards the end of the set, but not enough to allow Santa Cruz to take it. The second set ended with a score of 25-19. In an effort to prove they were still in the match, the Banana Slugs battled La Verne by scoring a point for every Leopard point in the third set. The score was tied for the majority of the set, but the Leopards showed they wanted to take the win. The third set was their last with a score of 25-21, ending the match in a final score of 3-0. “We believe in each other… we are a family,” Panatier said. The Leopards totaled six blocks and 60 digs against the Banana Slugs. Junior setter Kendall Kraiss had seven kills and 15 assists against Santa Cruz. “Our communication was good and we played as a team,” Kraiss said. La Verne finished the tournament with a final sweep of Principia, 25-17, 25-21 and 26-24. Junior outside hitter Randi Taylor-Toomay had 16 kills and 15 digs against Principia. She was ultimately named the tournament’s Most Valuable Player. Freshman setter Krystal Castellanos recorded 37 assists in the match against Principia. Junior middle blocker Kayla Cribbs, as well as Kraiss, were named to the All-Tournament team. “(The tournament) is good momentum for the rest of the week,” Kraiss said. “We are working hard every day,” Donohue said. On Wednesday the Leopards traveled to Whittier to face the Poets for their seventh Southern California Intercollegiate Athletic Conference match. La Verne was swept by the Poets, who advanced to 3-4 in SCIAC play, by scores of 25-13, 25-17 and 25-19. Whittier jumped out to early leads in the first and third games and finished a close second to clinch the sweep. The Leopards were led by Cribbs with seven kills, who was closely followed by Kraiss with five. The Leopards now hold a current SCIAC record of 4-3 and 14-8 overall. They take the court again at 7:30 p.m. against the Cal Lutheran Regals in Thousand Oaks on Tuesday. Sarah Sleeger can be reached at sarah.sleeger@laverne.edu.